SOUTH FORK, Colo. - "They're back!" yelled wildlife biologist Gene Byrne in February, as a lanky-legged lynx, trapped in Canada, bounded from a cage in Colorado's San Juan Mountains. "They never left," another Colorado Division of Wildlife officer, Bill Andree, said quietly. That exchange was symbolic of the lynx's return to the Southern Rockies this winter. As state biologists quibbled among themselves, opponents shared rhetorical blankets in a strange political bed. Livestock grazers sounded like biological diversity proponents, while outfitters and animal-rights activists protested in harmony. And wildlife agents and ski industry advocates, antagonists only moments before, issued interchangeable statements. The state of Colorado moved fast to put the wildcats on the ground, pushed by an expected federal listing of the lynx as threatened under the Endangered Species Act. Better to have the lynx brought back under the state's auspices, said Colorado Wildlife Commission Chairman Chuck Lewis, than for ski area expansions and other developments to be snarled in the red tape of federal law. But livestock grazers never accepted his argument. They feared the lynx's reintroduction would work to push them off federal lands, and they went to court demanding that the Forest Service complete an environmental impact statement first. The ranchers argued that the Forest Service should take responsibility for reintroducing the lynx, since the animals are expected to live almost entirely on national forest land. According to the law, however, wildlife belongs to the state and habitat belongs to the federal government. The livestock grazers had their day in court and lost. But the livestock lobby's core argument, that lynx reintroduction needed more study, is shared by Jasper Carlton, executive director of the Biological Diversity Foundation. To give lynx more chance for success, he'd also like to limit most uses of federal land involved, not just livestock grazing. "If everybody would just give a little ..." he often says. Carlton has been shoving the federal government toward lynx protection since 1994, when he petitioned to have the animal listed under the Endangered Species Act. The agency rejected the advice of its own field biologists, ruling that lynx remained common in Canada and Alaska and deserved no extra protection. Carlton sued, and a U.S. District Court judge agreed with him in 1996, triggering the proposed listing set to take effect this July. Like the livestock people, Carlton argues that Colorado biologists were rushing to bring in lynx without understanding what they need to survive. He fears that a failed reintroduction will cause federal wildlife officials to shrug off Colorado when they plan their recovery efforts. Wildlife biologists admit they're guessing at the lynx's habitat needs, and their uncertainty has disturbed both outfitters and animal-rights activists. "Sure, animals do starve to death in the wild," wrote University of Colorado biology professor Marc Bekoff of Boulder after two of the first five released lynx starved this spring, "but starvation brought about due to human translocation efforts simply is unacceptable." Four of the 13 cats have now starved, and a fifth was recaptured in an emaciated condition. The ironies continue: The strongest ally of the state wildlife agency has been the ski industry. In the past several years the state and the industry have bickered, mostly behind closed doors, about Vail's ski expansion into probable lynx habitat. But ski area planners seem to have been the first to suggest reintroduction of the lynx, an idea that dovetailed with the state's 20-year-old program of restoring missing and weakened components of the state's ecosystems. Moving ahead in lynx restoration means "we will be able to make decisions about the lynx based on actual information, as opposed to wild speculation about what their needs might be," said Melanie Mills of Colorado Ski Country USA, the industry trade group. Vail pledged $200,000 toward the reintroduction - well before the company sustained $12 million in damage from arson-caused blazes last October to its mountaintop facilities. Most of the pledged funds will go to aerial monitoring of radio-collared lynx. 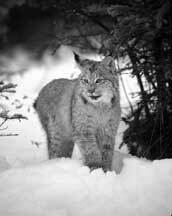 Besides the 100 lynx scheduled for release in Colorado this year, another 100 are to be released next winter, possibly in the Sawatch Range between Vail and Aspen. Although the lynx is still just proposed for listing in Colorado and 14 other states, the powerful Endangered Species Act is already modifying projects. Ski-area planners in Colorado say the potential listing caused Vail's expansion to be scaled back. Proposed highway expansions across Berthoud and Wolf Creek passes would need to include lynx-friendly overpasses. Any expansion of I-70, Colorado's Main Street of the Mountains, will likewise be evaluated for effects on the lynx. The lynx's return doesn't mean livestock grazers will be kicked off the national forest, says Gary Patton, a field biologist for the U.S. Fish and Wildlife Service, but he says federal agencies must start enforcing existing standards religiously. Ranchers have no fear of the lynx as a predator, says Freeman Lester, 63, president of the Colorado Cattlemen's Beef Association. "As for a cat killing a calf, that's not going to happen." Nor do they fear the wolverine, next on the state's reintroduction list. Instead they fear a Noah's Ark of endangered wildlife creating bureaucratic constraints on public grazing lands. "It seems like one species leads to another," he says. Sheepman Angelo Theos of Meeker agrees. A wolf reintroduction "would probably put us out of business," he says. Despite some official denials, the wolf seemed to be on the minds of many Colorado legislators, who approved a bill this winter which makes mandatory legislative approval before any more species are reintroduced to the state (see Hotline below). No wolves have been seen in Colorado since a government agent killed one in 1943 near the New Mexico border. But a survey of state residents several years ago found that 71 percent of those asked said they support wolf restoration. Moreover, studies in recent years have concluded that Colorado's teeming elk herds could now support between 800 and 1,128 wolves. The habitat "dwarfs Yellowstone," says Rob Edwards of the advocacy group Sinapu, formed to bring wolves back to Colorado. The state wildlife agency has officially opposed wolf reintroduction for the last 20 years. "It's not on our agenda," says Byrne, the biologist and a principal architect of lynx restoration. Ironically, Byrne must be careful about touching lynx. He's wildly allergic to them. Allen Best writes for the Vail/Beaver Creek Times as well as other papers in Colorado. * Ted Zukoski, Land and Water Fund of the Rockies, 303/444-1188.